In case you haven’t heard, the state is supposed to get a pretty heavy dose of precipitation this upcoming weekend. Unfortunately, weather forecasters don’t know what that precipitation will be. It may be rain. It may be snow. It may be sleet. It may be ice. They really have no clue. Not to go all Gary England’s Weather School on you, but the type of precipitation we receive depends on ever-fluctuating air and ground temperatures, and a few other weird factors, which can all be very difficult to predict this far out. Speaking of Kent Ogle, that wasn’t even the strangest thing to happen at KFOR this weekend. On Tuesday, I was walking towards the break room to try some of Scott Hine’s delicious cheesy jalapeno skillet cornbread. As a I turned a corner, I saw this thing staring right at me. Apparently Linda Cavanaugh stayed at 21-C for New Year’s Eve. I guess she had so much fun repositioning the boutique hotel’s Purple Penguins that she purchased cardboard cutouts of KFOR’s A-list talent to hide and position around the news bunker. Anyway, I guess stay tuned to KFOR, News 9 and even KOCO for coverage of the big winter weather event that may or may not happen this weekend. Either way, play it safe and cancel all plans. At this point, even if the weather isn’t that bad, everything will probably be closed. Also, stock up on Oreos. You don’t want to be trapped without them. Emily has officially jumped the shark. If history is any measure…. The 1-44 thing is real. North of 1-44 & 1-40 you may get ice. South of that probably sleet & rain. When I ran heavy equipment our company was on stand by for the “winter storm of a life time”. We got about 4″ of sleet, so who knows. Scott is a vegan. He’d never make cheesy cornbread! If she’ll come to my house, I’ll show her how to create a hot lava volcano with things just laying around. Wow. Someone has been hanging out in his mommy’s basement for far too many years. 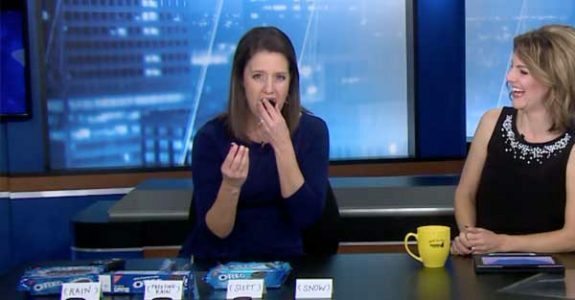 Emily’s subtle way of saying she’s pregnant and needed a way to satisfy her cravings during the broadcast? My thoughts exactly, but not from this particular WeatherSchool lesson. I thought I noticed her sporting a belly bump in one of Ashley Kringnenen’s wedding pictures, but maybe her six-pack abs were simply working overtime on a bad piece of fish. I have never felt confident in Emily Sutton & this little stunt confirms my reservations. Again, I’m late to the party, but all this time I thought I was seeing Emily’s boo-tay in the second photo (with “Skunk Beer Face Kent”). Hahahaha – it was the back of her chair all along! I’m such a special case! !